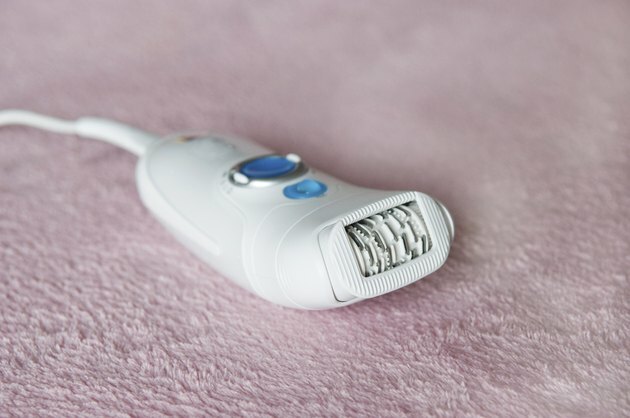 Epilators are electric hair removal devices that quickly pull hair from its root. "Many people choose this method of hair removal because it is safer than shaving and less messy than waxing, according to "Cosmetic Dermatology: Principles and Practice." It is safe to use an epilator as often as you feel necessary, though most people need to use an epilator every three to six weeks. Ensure that your face is clean, dry and free of all makeup and lotions. Also, ensure that any hairs you wish to remove are at least 1/4 inch in length. This is the minimum length of hair for the epilator to properly and safely remove the hair. If the hairs are not at least 1/4 inch long, wait until they grow to that length to use the epilator. Turn on the epilator and adjust the speed to your preference. The "Handbook of Dermatology: A Practical Manual" suggests starting at a medium setting and adjusting to a faster or slower until you reach a speed you are comfortable with. Press the head of the epilator gently against your face approximately 1/4 inch below the area with the hair that you wish to remove. The epilator should be held so that the head rests flush against your face. Glide the epilator slowly over the hair you wish to remove in the direction opposite the hair growth. Massage a dime-sized amount of facial moisturizer gently into your face to soothe the skin after using the epilator, which can be harsh to your skin. Switch off the epilator and unplug it. Remove the epilator's head from it's handle and use a brush to remove all hairs. Rinse the head under a stream of water to release remaining hairs. If hairs remain in the head, soak it in a mixture of lukewarm water and three drops of mild dishwashing liquid for three minutes. Cleaning your epilator after each use will remove harmful bacteria and prevent any infection of your hair follicles.